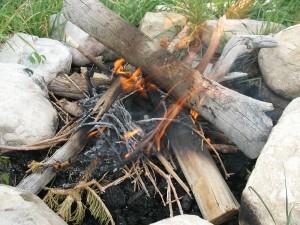 When starting a flint and steel or striker type of fire, char cloth makes all the difference in being able to actually get the fire started or just making a bunch of sparks that never catch anything on fire. Char cloth (sometimes also called charred cloth) is one of those amazing mountain man items that is still very useful today. 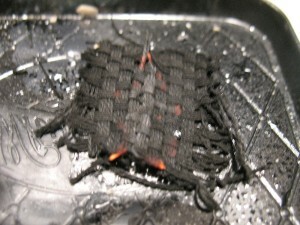 Char cloth is pieces of blackened fabric that easily catch a spark and burn similarly to the way steel wool burns–no big flame, but a nice ember burn that doesn’t blow out once it’s lit. The spark lights the char cloth and the char cloth is used to light the other tinder. I’ve been wanting to add char cloth to my fire kits and having used all my char cloth made by others, I decided to make a batch of my own. I had some basic directions to go off of, but had never made it myself, so here’s how the first round went. 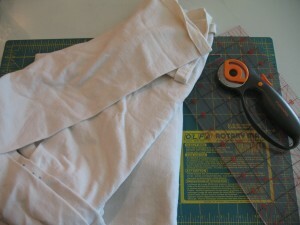 I got some 100% cotton fabric–I used jersey fabric (an old T shirt) and cut it into approximately 2″ squares. Mine was kind of a natural color, but you could probably use any color you have, just avoid screen-printed designs, etc. I cut the ribbing off from the neck and sleeve ends as well as the seams. You just want the fabric. 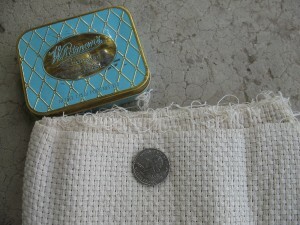 Next, I got a metal can–I used an old cookie tin. I punched a vent hole in the can lid with a hammer and nail. You can use whatever metal can you have–I’ve seen it done with smaller tins as well as cleaned out food cans with foil for a lid. I put the cut up fabric squares in the tin, put the lid on, and put the can on my grill on low and let it cook. You definitely want to do this outside–burning fabric doesn’t smell all that good. My instructions said to cook it until it stopped smoking. I had the tin fairly full, and cooked it close to 3 hours before I decided to turn it off. It never smoked a lot. 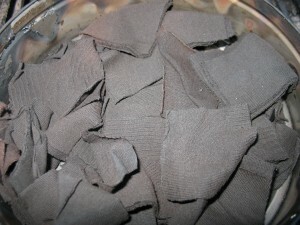 When it cooled, I opened the can and only the bottom 3-4 layers were black, the rest of the fabric was brown. I turned the pile over and put it back on the grill on Medium this time and cooked it another close to 3 hours. This time it was all black when it was finished. However, it didn’t catch a spark very well. I could light it with a flame, or an occasional large spark, but it was very frustrating to work with. Nothing like the char cloth I’d had before that a friend of ours made from terry cloth (old towel). So I put it back on the grill again, this time I only filled the can about 1/3 full and cooked it on high another 3 hours or so. Now it was a little more fragile and easy to tear (as char cloth generally is), but it still didn’t catch spark well. I had no more ideas to make it better, so I decided to start over. 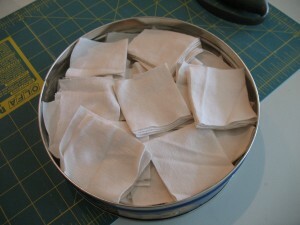 The second and far better batch of char cloth I made started with 100% cotton monk’s cloth I got at Walmart. Notice the loose weave and air holes. Those made a huge difference. I cut it a little smaller this time–about 1 1/2 inch square as 2″ was a little larger than necessary. There is some shrinkage as it cooks, but not that much. I wanted to see if it would work straight from the store without washing the fabric first, so I only cut 5 squares of it. 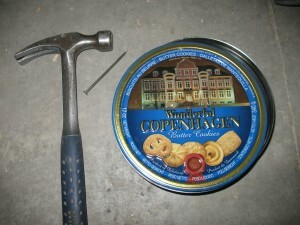 I put it in a smaller tin which also got the hammer/nail air vent in the lid. Feeling like I’d spent enough of my grill gas on this project, I opted to do this round real mountain man style and build a fire and toss the tin in the fire. I pretty well buried it–it’s in there somewhere. It did not cook long in the fire–maybe 15 minutes (of course it was in a smaller tin than the first round, but I’m guessing even a large tin wouldn’t take 9 hours in the fire). I couldn’t tell when it stopped smoking since it was in a fire with all the rest of the smoke, so I just guessed at when to pull it out. It wouldn’t matter if it stayed in there until the fire burned out as long as no sparks got in the airhole and caught all the fabric on fire in the meantime. So, to recap, to make better char cloth, start with a 100% cotton fabric with texture and a fairly loose weave. Use a fire pit if you can to save on gas. Cooking on higher heat and cooking a smaller batch help speed up cooking time. Happy firestarting!